Do you think this dish looks really fancy? Me too. That’s why I chose it to make for my husband on the night of our anniversary. I wanted to make something special and impressive. So you can imagine my surprise when, only 30 minutes after I started cooking, it was pretty much done. And I thought, “wow…that was much easier than I thought.” I love when things look a lot harder than they really are. And not only does it look impressive, it tastes impressive too! This is totally a restaurant quality dish that your dinner guests will love! Unless they’re vegetarians…in which case they’ll probably just sit and sulk that they have to eat tofu or something while the rest of you dine on this amazing steak. If you’re like me, some of the instructions below may be new to you. For example “scoring” the steak and understanding how to roll it up and cut it. I wish that I had taken step-by-step pictures for you, but I promise that the next time I make this dish, I’ll come back and post some more pictures for you! However, if you just do exactly what the instructions say, you can’t go wrong. Happy eating! In a large skillet cook bacon over medium heat just until brown, but not crisp. Drain on paper towels. Set aside. Trim fat from steak. Score steak by making shallow diagonal cuts at 1-inch intervals in a diamond pattern. Repeat on other side. Cut steak in half lengthwise. Place a portion of steak between 2 pieces of plastic wrap. Working from the center to the edges, pound lightly with the flat side of a meat mallet into a 10x6-inch rectangle. (Don't worry if it's not exactly this size, mine was a little smaller.) Remove plastic wrap. Sprinkle with 1/4 teaspoon of the lemon-pepper seasoning and 1/8 teaspoon of the salt. Arrange 4 bacon slices lengthwise on steak. Repeat with the remaining portion of steak. For filling, in a medium bowl combine spinach, bread crumbs, thyme, and the remaining lemon-pepper seasoning. Spread half of the filling over each portion of steak. Starting from a short side, roll up each portion into a spiral. Secure with wooden toothpicks at 1-inch intervals, starting 1/2 inch from one end. Cutting between the toothpicks, slice each portion into six 1-inch pinwheels. Thread pinwheels onto skewers. Remove toothpicks. 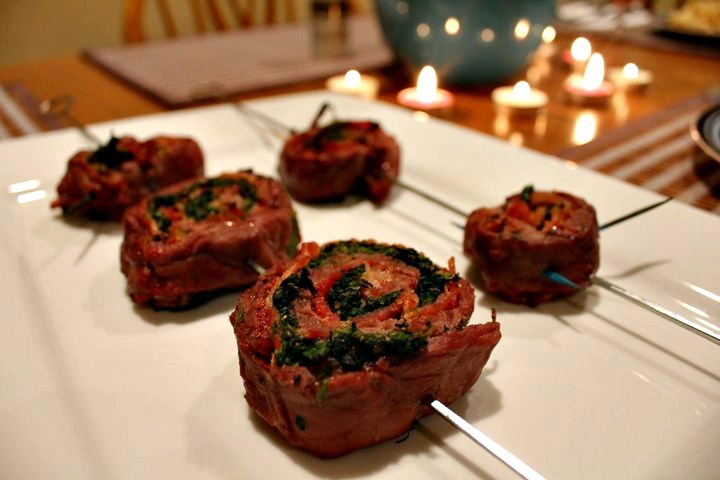 Place pinwheels on the grill rack. Grill until steak is desired doneness. For a covered grill, allow 6 to 7 minutes for medium (160 degrees F). For an uncovered grill, allow 12 to 14 minutes for medium (160 degrees F), turning once halfway through grilling.